The cyber-security pioneer has rebuffed suggestions that the alleged incident undermined his own credentials saying: "I have no control over Twitter's security". Image caption John McAfee's Privacy Phone promises to "lock down communications"
Mr McAfee came to prominence in the 1980s when he founded a company that released the first commercial anti-virus software - McAfee VirusScan - and helped spark a multi-billion dollar industry. Although that business has since been sold to Intel, he still develops cyber-security products of his own. The Scotland-born entrepreneur also heads up the Bitcoin mining operation MGT Capital Investments, which solves complicated mathematical problems to verify transactions in the virtual currency. In recent times, he has come to be seen by some as a crypto-currency guru. Earlier this month, Mr McAfee began issuing a daily recommendation about which of the more obscure virtual currencies he recommended others should invest in. These "coin of the day" picks often pre-empted a spike in the value of the selected assets. 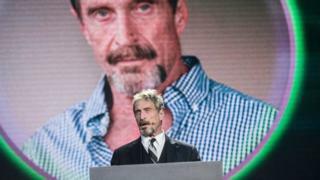 On Tuesday, Mr McAfee declared he would slow down his recommendations to once a week, with the next one due out on 1 January. But the next day, his Twitter account began firing off picks in rapid succession. These messages were later deleted and Mr McAfee posted that he had been hacked, adding that he had no clue how this had been achieved. Several of his 530,000 followers have speculated that the person responsible might have been able to profit by encouraging others to push the mentioned crypto-currencies higher. Mr McAfee is often perceived to be both a colourful and divisive figure. Following the report that his Twitter account had been hacked, some other security experts took the opportunity to poke fun at him. They include Marcus Hutchins, the 23-year-old who thwarted a giant ransomware attack earlier this year, only to face controversy himself when he was arrested by the FBI and accused of making other hacks possible.